← Scotland’s Towns Conference 2011: Think Local – Act Local! Whole Foods Market, Giffnock. Yes, Whole Foods Market, Giffnock. You have to say it twice to quite believe it. 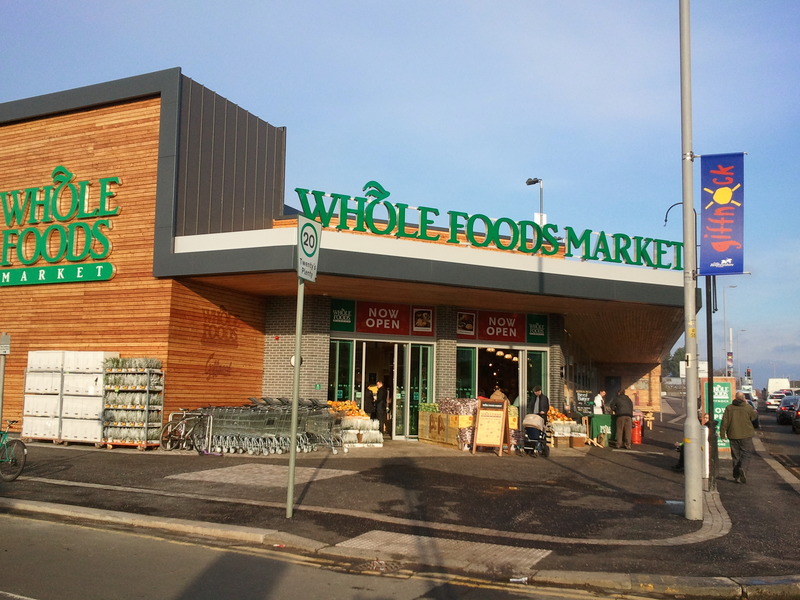 Did you really think that the next foray into the wider UK by Whole Foods Market would land up in Giffnock? Really? But on the 16th November that is precisely what happened with the opening of 20,000 sq ft of US organic-oriented food and retailing in Giffnock, just down from the Morrisons. Now I’ve been watching Whole Foods for well over a decade. When living and travelling in the US I’ve gone out of my way to visit them. We’ve taken study tours over to look at them, and some delegates bear the live lobster scars to this day. Their flagship store in Kensington, London was interesting, but a disappointment in parts to me. I never felt their takeover of Fresh & Wild made sense (though the private label went from 365 to Fresh & Wild, which does sound better) and clearly they thought the same, as half the original few stores were closed. Trading has not been wonderful in the UK, and like other US big box imports, early claims of tens or hundreds of stores have never materialised. So Giffnock was obvious, right? The Saturday immediately after opening is probably not the ideal time to visit a new store to see how it’s doing, but I really couldn’t wait. So Giffnock on a Saturday morning, it was. And my impressions? Its site is not ideal, and the car parking is compromised, being limited and on the roof. Access could be an issue. It is clearly still in a honeymoon period, but boy was it busy. The checkouts were overwhelmed by the volume of people and it was hard to move around. The small cafe was mobbed. Will this last? And if it does, how will they cope? Much of the classic Whole Foods signatures were in place with magnificent visual merchandising of fresh vegetables and fruit, amazing meat/butchery, cheese and bakery counters and a plethora of ethical and healthy messages. Whole Foods know how to put on a visual retail show. There was a lot of noise about Scottish products and producers with themed displays, visual maps of Scotland and video shelf-edge labels presenting producers (also on their YouTube Whole Foods Giffnock channel). Despite the American accents of some staff, this felt like a Scottish focused store. There will need to be an education process around the store. For consumers, the prices will be a shock and it is not known as Whole Pay Check in the US for nothing. This is high-end, quality, but very expensive retailing and the market for this in Scotland/Giffnock is uncertain. For employees, the range of products is a challenge. We bought some Russet Apples (sourced in Scotland for a change) but at checkout had to confirm to the operator that they were apples, and not pears. This was one of my complaints about the London store – the London staff were nowhere near as knowledgeable as staff in their stores anywhere in the US; I hope the same is not going to be true here in Scotland. So, watch this space. An overseas import, in a big box, at a high price point, during a recession, is a bold move. But Whole Foods adds something to Scotland and provides a true lesson on product presentation and aspects of sourcing. They look great – and tend to taste great – and set the bar really very high, though at a price. If you can’t get to Giffnock anytime soon then this West Coast rap video on the Whole Food Parking Lot might given you some sense of the original (or not) – thanks to Jonathan Rippon for the link. In another international expansion of note, Decathlon the French sports retailer opens in Edinburgh this week, and is threatening both to expand to 6 stores (this will be its second) in Scotland and to bring its sports village concept to Scotland. The sports village provides a mega-store and sporting facilities on one site. If this materialises then another challenge will be laid down to indigenous retailers. This entry was posted in Competition, Food Retailing, International Retailing, Whole Foods Market and tagged Food retailing, Giffnock, Merchandising, Whole Foods Market. Bookmark the permalink.